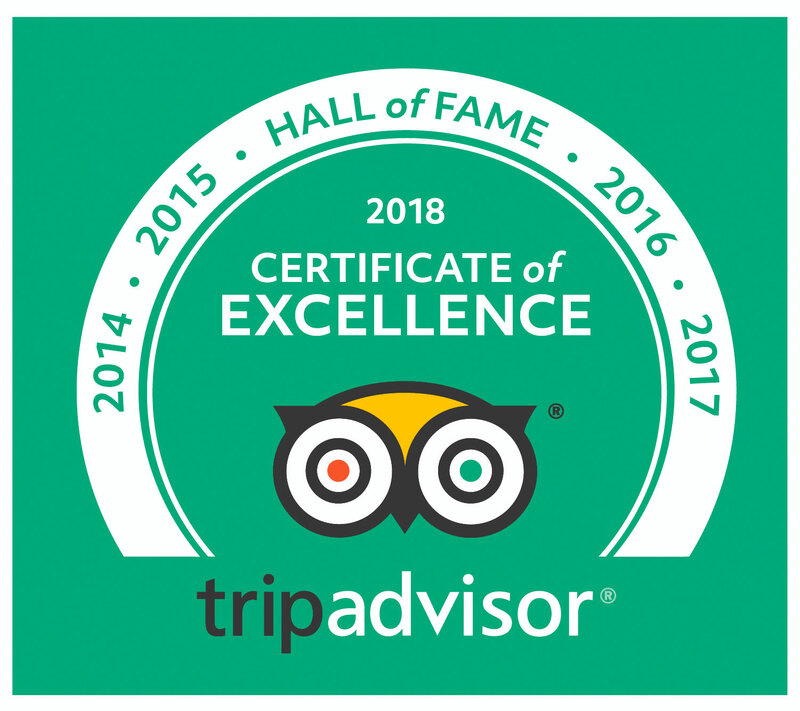 Roland has very kindly allowed me to share his recipe for the Bacon Loaded Pierogies that won both the judges and peoples choice prizes at Bacon Camp Columbus last weekend. 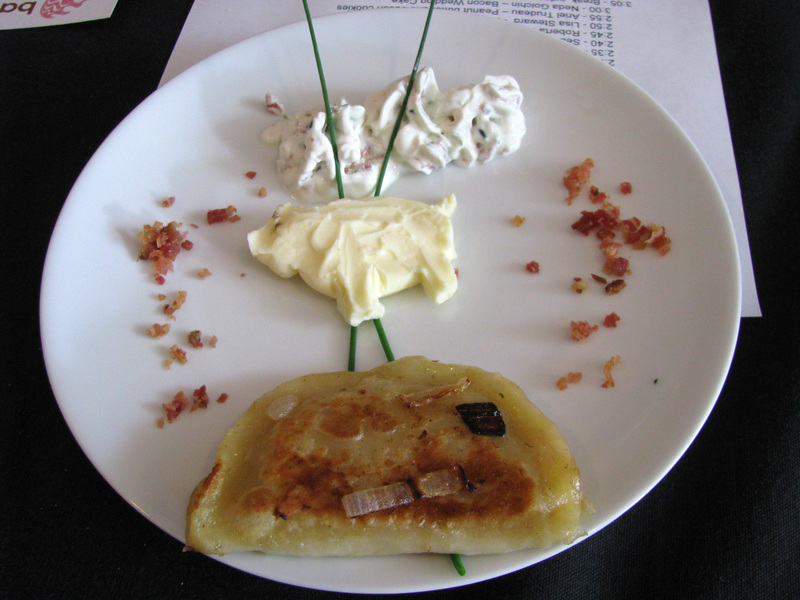 Roland was featured in The Other Paper in an article entitled ‘Pirogi Chef wins Bacon Title’. Awesome. His Pierogies were unbelievably good and although you can see that they involve a fair amount of work, I can assure you it is worthwhile. You can make a large batch and freeze them, but I guarantee that they won’t last long. These things are the stuff that cravings are made of. In a large bowl mix all of the ingredients together. Knead until well combined. Cover with saran wrap and refrigerate the dough for 20-30 minutes. Roll out the dough on a floured surface to 1/8th-1/16th inch thick. Cut circles approximately 3 inches in diameter. Roland used a Comfest mug! Boil and mash the potatoes but do not add any butter or milk. Sauté the onions in butter until soft and translucent. They should not brown. Bake the bacon on a cookie sheet covered in aluminum foil in the oven at 400° F for 20 minutes (or until crisp). Drain/ dry the bacon fat and save for future use. Finely chop the bacon (this is easiest in a food processor). Combine all of the filling ingredients. If you whiz them together in a food processor the mixture gets a little sticky which makes it harder to work with, but it seems to combine the flavors the best. Taste the mixture and add extra seasoning, or chives to taste. Put a spoonful of the filling onto each circle and press the edges together to form a semi circle. Roland did not use anything additional to seal them, but some recipes use an egg wash for added adhesion. Cook the pierogies in large pan of boiling water for 5-6 minutes. Remove from the pan and drain. At this stage the pierogies can be refrigerated, frozen or finished for immediate eating. They will keep in the refrigerator for a few days, but can also be cooked directly from frozen. Pierogies are cooked twice, so to eat them you then fry them. You will need more butter (or bacon fat if you have some) and some coarsely chopped onions (these add flavor). Use a large skillet over a medium high heat. Fry the pierogies with the onions for 4-5 minutes on each side (checking to see how done they are). Make sure you add more butter when you turn them so that they don’t stick. Cooking time and the amount of butter will depend on the type of pan and the stove. They should be heated through, golden and crispy. Serve with sour cream and more butter. For the competition Roland served the pierogies with special bacon and chive sour cream (delicious). Simply add finely chopped bacon and chives to the sour cream. 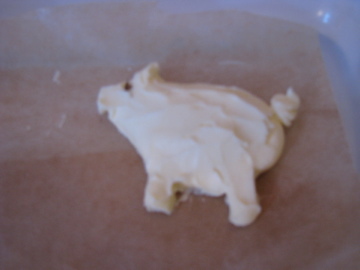 The butter pigs were a Hungry Woolf creation made by piping whipped butter and the eye is smoked sea salt. At the Pierogi Palace in Cleveland today we saw a huge array of pierogi fillings. We have been busy brain storming ideas for other great flavors…. my nominations are pot roast, mashed potato and onion gravy and pumpkin pie pierogies. 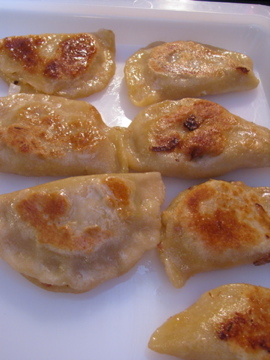 Do you have any ideas for sweet or savory pierogi fillings? Let me know. Roland is the Pierogi King of Columbus. My Bobci use to make prune ones that were absolutely delicious. I guess you could also make fig, feta and pecan ones. Or add some chocolate to the prunes . An ex of mine is Polish, and his family did a big Polish Christmas dinner every year. They made all sorts of pierogi, but they had prune ones that were suprisingly SUPER good! I LOVE pieogies. Thanks for the “loaded” recipe. My family makes hundreds of a more tradtional recipe every Christmas. My website has this recipe. i just made your Perogies! They were the best! My Husband wants me to a batch for him & his Hunting Family!! Will definitely share your recipe! Can I substitute the rendered bacon fat as something else?